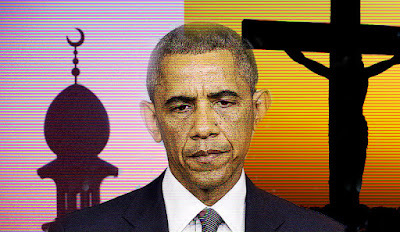 Doug Ross @ Journal: ANSWERING THE MEDIA’S QUESTION: Is Obama a Muslim? ANSWERING THE MEDIA’S QUESTION: Is Obama a Muslim? I do not believe Barack Obama is a Muslim, nor do I think he is a Christian, nor do I think it matters, because he is not motivated by any religious belief, but by a secular ideology. All of his convictions and actions can be explained by a single supposition. Obama is dedicated to the subversion of Western, in particular White European, Judeo-Christian-based democracy. In the world today, the two strongest forces opposing Western, Judeo-Christian democracy are radical Islam and Marxism in its current manifestations. The proponents of radical Islam and Marxism have a shared hatred of the United States as the embodiment of evil and the main impediment to the subjugation of the individual by either Sharia or the state. In that respect, Obama's modus operandi can be considered Islamo-Marxist by embracing their methods that, he thinks, can effectively undermine American culture and weaken the ability to transmit to future generations the principles upon which the United States was founded, in order to pave the way for a new political order, his so-called fundamental transformation. The uncontrolled immigrant invasion; the constant promotion of Islam; the fostering of homosexual and transsexual lifestyles; the rejection of Constitutional processes; the nurturing of domestic extremist political movements like Black Lives Matter; the growth of government and unsustainable debt; the pursuit of a dangerous foreign policy; the Stalinist-style political correctness; and other insults to American values and traditions are not meant to solve any problem or redress any grievance, but are all specifically designed to weaken the national soul, compromise national security and relegate patriotism to little more than an underground resistance movement. It is most likely that Obama is amoral, believes only in his own narcissism and is driven by contempt for everything the United States represents. The real American calamity, however, is not Obama, but the corrupt political-media establishment that allowed him to occupy the Oval Office for eight destructive years. It was the far-left Democrat Party and the fawning, biased media that facilitated his rise to power and uncritically and shamelessly protected him in office. It was the Republican eunuchs who disgracefully refused to vet Obama or oppose any of his policies. It is an unfortunate fact that American politicians, collectively, both Democrat and Republican, do not trust representative government and care nothing about the Constitution or the rule of law. They believe only in the pursuit of personal power and profit via a warped legislative process, executive overreach and a constant stream of guaranteed taxpayer revenues. Both parties use campaign deception, practice political expediency, engage in crony capitalism and, when necessary, promote voter fraud to sustain the corrupt status quo. Instead of acting as the people's "watchdog," the media support the permanent political elite by preserving the illusion of democracy and enabling tyranny by misinforming Americans and manipulating public opinion. Realizing that they no longer have representative government nor can they rely on the media, the voters are flocking to Donald Trump because there is no one else to whom to flock. Make no mistake, the political-media establishment fears Trump, not because they fear for the well-being of the country, but because, if he wins, Trump might investigate and prosecute the corruption in Washington DC. In such a situation, most members of the political-media establishment would lose their jobs and some would go to jail, complicit in perpetuating the greatest fraud and Constitutional crisis in US history. I don't care about Obama's religion or his sexual orientation, if he plays with dolls or if his favorite sport is croquet. I only know that he is bad for America. And that's enough for me. Although Obama will be gone soon, the national wounds he inflicted will take generations to mend. That healing cannot occur, however, while the disease that made a President Barack Obama possible persists. The hopelessly corrupt political-media establishment must be swept away. A well reasoned and presented position. Anybody want to present a well reasoned counter position? I believe he is a taqiya practicing muslim subverting the constitution and freedoms of America. I read half (with no apologies/so there). I'm vomitous sick of the supposition. HE WAS RAISED BY A GAY TRANSVESTITE. THE MOOSETURD CALL TO PRAYER, IS HIS FAVORITE SOUND IN THE UNIVERSE (after a baying goat, in heat). IT IS NOT A MAN. One, out of one and a half billion mooselimbs (pheromonic communication exclusively/hive mentality). I'd provide the BBC, link. About infinite swarms/colonies (of bazillions of ants, taking over the planet. But, mebbe you can? (Linked it numerous over at anechoic). Nerf pistols at ten paces beaches, really tired of dis kwap. Sen. Barack Obama slips up on ABC's This Week with George Stephanopoulos and refers to "my muslim faith". Thanks for the 'all about mo' link! I will, for the most part, agree with much of your article. However, Barak Obama is a devout muslim, practicing taqqiya, and is doing much of what you referenced as per the destruction of the US and the western Judeo-Christian world to advance islam. What you willfully fail to see in Obama is the reason for his narcissism : He sees himself as a great figure in islam, a muslim who sneaked into the presidency of the United States and who helped remove the "great Satan" to pave the way for islam to destroy the "little Satan" and do his part to pave the way for a worldwide islamic caliphate. Yes, he's using marxism, socialism, Cloward-Pliven, etc. to advance the cause, but make NO MISTAKE as to the underlying reason he's doing it. He KNOWS exactly what he's doing, and he's getting away with it so far. When the history books are written, he believes islam will have triumphed, and he will be recognized as a muslim who did much to bring it about. I agree with what Tim Cronin says above. I think Mr. Cronin is spot on. Mr. Obama is sympathetic to Islam, but he is no Muslim.. He has a romanticized and totally unrealistic idea of Elements of Islam that some how for over a thousand years have made it more than acceptable to commit genocide in the name of Islam. I point to India where there was zero Muslims before the invasions by people like Muhammad bin Kasim in the 8th century and many other subsequent attackers from the North west in the subsequent centuries including Muhmood Ghazni, Timur Lung and nadir Shah, who managed to forcibly convert local Hindus and killed tens of innocent Hindus from the 11th through the 18th centuries. A great majority of Muslims want the same thing as any civilized person want, but Islam desperately needs Reformation to absolutely disallow the justification for killing non Muslims. Specifically Mr. Obama does hold the doctrinaire ideas as mentioned by Mr. Sellin. However, in reality he is incompetent like a child wearing his Father's suit. Thus many of his lack of skills in executing are reflected in a failure of everything he has touched.